a13359 14kt Yellow Gold Three Stone Tie Tack For (3) 3mm Round Faceted Gems. Use diamond cut stones. For (3) 3 4 or 5mm Round Faceted Gems. Use diamond cut stones. a13360 14kt Yellow Gold Three Stone Tie Tack For (3) 4mm Round Faceted Gems. Use diamond cut stones. 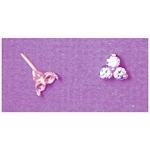 a13361 14kt Yellow Gold Three Stone Tie Tack For (3) 5mm Round Faceted Gems. Use diamond cut stones. a16521 14kt White Gold Three Stone Tie Tack For (3) 3mm Round Faceted Gems. Use diamond cut stones. For (3) 3mm Round Faceted Gems. Use diamond cut stones. a16522 14kt White Gold Three Stone Tie Tack For (3) 4mm Round Faceted Gems. Use diamond cut stones. For (3) 4mm Round Faceted Gems. Use diamond cut stones. a16523 14kt White Gold Three Stone Tie Tack For (3) 5mm Round Faceted Gems. Use diamond cut stones. For (3) 5mm Round Faceted Gems. Use diamond cut stones. a19849 Sterling Silver Three Stone Tie Tack For (3) 3mm Round Faceted Gems. Use diamond cut stones. a19850 Sterling Silver Three Stone Tie Tack For (3) 4mm Round Faceted Gems. Use diamond cut stones. a19851 Sterling Silver Three Stone Tie Tack For (3) 5mm Round Faceted Gems. Use diamond cut stones.